In the United States, diabetes is the leading cause of blindness each year. Dry Eye Syndrome, early incidence of cataract, increased risk of glaucoma and, most seriously, diabetic retinopathy may be associated with systemic diabetes. Whether a patient is a life-long insulin-dependant diabetic, or someone recently diagnosed as non insulin-dependant, these risks are inherent to the disease. Many times diabetes is first diagnosed through the routine eye exam. In the majority of cases, a team of physicians is required to properly manage patients with diabetes. 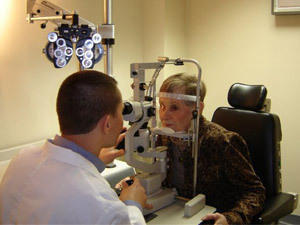 As Optometrists, many times considered the “family eye doctor”, Drs. Reto, Halscheid and Bakker are uniquely positioned to manage the ocular manifestations of diabetes. In fact, many times diabetes is first diagnosed through the routine eye exam. In our practice, special emphasis is placed on the education of diabetic patients and communication with fellow physicians. First and foremost, patients with diabetes need to understand the associated risks and the steps necessary to maintain proper care. Our doctors are scheduled in such a manner that no patient leaves their appointment before every last question is answered. Additionally, when the secondary ocular manifestations to diabetes develop (from Dry Eye Syndrome to glaucoma), our doctors are trained and experienced in handling these conditions. Communicating with the family internist, the endocrinologist and, when necessary, the ophthalmologist is essential to proper co-management of diabetic patients. Our staff includes Dr. Bruce Saran, one of the area’s leading retinal specialists. Dr. Saran’s services are readily available when laser treatment or surgical means become necessary.